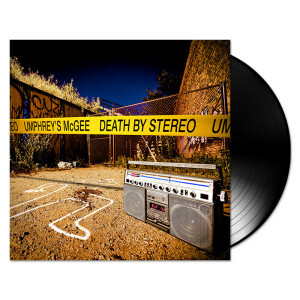 Death By Stereo vinyl double LP includes three bonus tracks on side D, and comes with a CD copy of the album. "'Death By Stereo' is a lethal musical gumbo stewed by the band's seemingly telepathic six members. The album finds the “fluid and majestic” (Washington Post Express) sextet’s feet firmly entrenched in hard-hitting rock while still exploring radical new territories: 'Sticky Fingers'-era Rolling Stones romp on "Wellwishers," Black Keys-style blues on "Domino Theory," and horns-infused 70s funk on "Booth Love." "Conduit" delivers the type of dual-guitar fireworks that Umphrey's has become known for and “Miami Virtue” is an upbeat, kaleidoscopic blend of Phoenix and Pink Floyd."